During the summer of 2013, 17-year-old YouTube kid Troye Sivan switched on his webcam, stared straight into the lens and hit record. “This is the probably the most nervous I’ve ever been in my entire life,” he said, his blue eyes unblinking. “The date today is August 7th 2013, and the reason I’m telling you this, is because on August 7th 2010 I told my family that I am gay,” he drew a deep breath and continued: “And now, on August 7th 2013, I want you guys to know that I’m gay.” After describing his sexual discovery in candid detail, he then uploaded the video to YouTube, and waited for the response to pour in. Two years later, and the video has been viewed over six million times. Troye Sivan’s YouTube channel remains the third most-subscribed account in Australia and Time magazine has recently labelled him one of the most influential teens in the world. Of course, it wasn’t just his “coming out” video that propelled him to fame (he had already appeared as an actor in 2009’s X-Men Origins: Wolverine, and had built up a loyal YouTube following before then), but the clip perfectly embodies the unabashed openness of somebody brought up on the Internet, as well as the positive impact that can have. While Troye may have single-handedly shaped his stardom via video blogs, it’s his music that has earned him staying power. Free from the pop song covers that peppered his early beginnings, he has evolved into a songwriter with a flair for storytelling, able to craft dark, glistening pop concoctions that echo his idols with a unique, effervescent twist. The glitch-filled poeticism of Lorde, the candidness of Frank Ocean and the sparkling pop flourishes of artists like Years & Years and Shamir can all be felt on Wild, his perfectly-formed 6-song EP. With debut album Blue Neighbourhood peeking around the corner, we spoke to Troye over the phone about being a child star of the Internet and the pressures of being considered an LGBTQ icon. Your “coming out” video has been viewed over six million times. Why was it important for you to make that video? Troye Sivan: Well, I had been out of a while to family and friends. I was secure in myself, but I was just about to turn eighteen and I wanted to go out and date people and not worry about being “outted” anymore. On a wider scale, I was using the Internet as I was coming to terms with my own sexuality and it just so happened I watched every coming out video on Youtube that existed. I knew I had a big audience online, and I had a chance to give back to that YouTube community and say thank you to them. What was the response to that video and how did your life change? Troye Sivan: It was overwhelmingly positive. I still get messages to this day about that video. For the first time in my life, I didn’t have to worry about anything. I didn’t realize how much being in the closet previously affected my decisions, and I think it still affects me to this day. Even just down to the TV shows I’d watch in secret because I thought people would make assumptions. Now I watch whatever I want and wear what I want; I’ll paint my nails before a show if I feel like it. Coming out was bigger than saying, “I like boys”. It was liberating in every aspect of my life. What advice would you give to young LGBTQ people who are afraid to come out? Troye Sivan: I’d say try to come to terms with yourself first. When I was about to come out to my family, I knew in the back of my mind that they were going to be okay with it, but on the one percent chance they wouldn’t be okay with it, I knew that there'd be people out there who would accept me. Having that self-worth makes it easier. Also, wait until it’s safe. If you feel it isn’t going to go down well, if your still living with your parents or they’re paying for your college then maybe wait a while until you’re in a more stable environment before telling them. You seem really open in your videos, almost like a diary. Do you apply the same openness to your music? Troye Sivan: Yeah, definitely. If anything, the music is a whole new level of that. When I was fifteen, I wrote a diary for about a year and I was so shocked how for the first time in my life I was completely honest with everything. Even with your family and friends you kind of tell a story in a different way. You can never say exactly what you’re thinking but with a diary you can literally say whatever you want. I found the same thing with songwriting. It’s cryptic enough where people try to decipher what you’re saying but you can just deny it! Some of these songs are dark thoughts I don’t even want to talk about with myself, but I’ll write the lyric just to get it out. It’s so private, which is weird because I’m about to release it to the world. Tell me about your new album Blue Neighbourhood? What does it sound like? 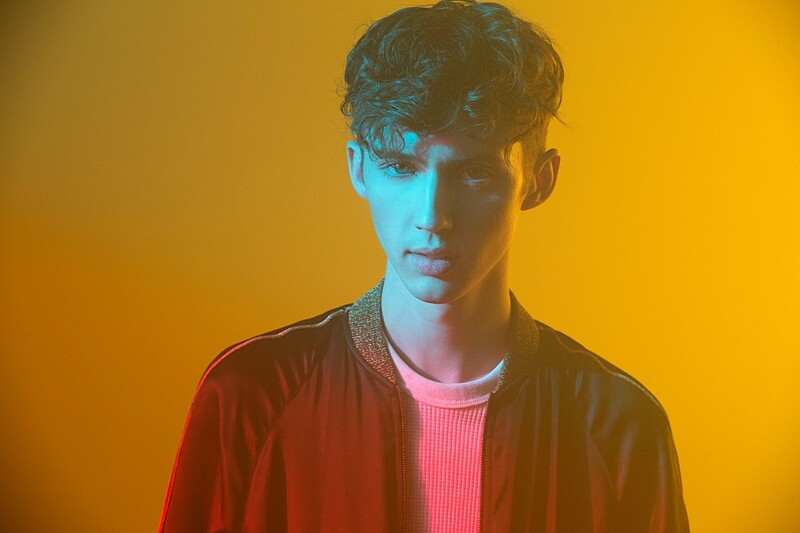 Troye Sivan: We released the mini album Wild to give people a taste, so it’s like that but much more in-depth. I’m so heavily influenced by what I listen to a lot of the time, and if I’m listening to a trap music or The Weeknd then chances are that’s the kind of music I’ll make because that’s what’s exciting at the time. But because I’ve had a year and a half to make this album, all of my influences are on there, and you get the full scope of my musical landscape. It’s something that I didn’t really expect. Last year, Time magazine named you one of the most influential teenagers in the world. Does that type of influence feel scary? Troye Sivan: That’s the craziest accolade I’ve ever received, and it’s hard to believe. It’s all well and good to use my platform to show my music but at the same time I hopefully have the chance to make a change and just talk about things I feel passionate about – it’s exciting. If I feel strongly about a certain issue, I feel as though I can do something about it. I can just turn on my phone and start a campaign. It’s something that I need to keep reminding myself about. Like, if I am going to do music videos, there can be messages to put into them. Although you’re 20 now, you could be called a “child star” because you started so young. Child stars don’t have the best track record for keeping stable. Is this something you worry about? What do you do to stay grounded? Troye Sivan: It is something I worry about because it’s easy with a clear mind to say “oh, I won’t do that”, but I feel like I’ve had enough of a taste to know how crazy things can get. I can completely understand how people lose their mind while all that is happening to them. I’ve got my family on tour with me right now and that’s helping a lot. I also go back to Australia all the time where my three best friends live and that’s completely grounding. When I’m in LA for too long I have way too long to think about wanting a Mercedes or an amazing apartment. Then I go home and realize that none of that matters. You modeled for Hedi Slimane earlier this year. What did that feel like? Troye Sivan: It was insane, but it felt so organic. Hedi heard my music and he was into it, so we met for lunch. Then one day he was like, “I’m in LA, we should go around and I’ll shoot you for my journal.” Two weeks later, he called me from Paris and asked if I could walk in his show. I’m so in love with his clothes, and he’s an amazing man. Wow! What was it like walking the runway? Troye Sivan: Terrifying! I’ve never done anything like it. I was there for two days and it was overwhelming. It was really loud and the whole thing was over in ten minutes, which was shocking to me – all of that craziness and work for ten minutes. If you could pick one moment that has most inspired you, what would it be? Troye Sivan: When Taylor Swift tweeted about my music. When I was writing the songs, her album 1989 had just come out and I was in awe of her songwriting, being a marketing genius and being in charge of her own life. She’s the ultimate pop star. To have her praise the EP was a real nod of approval and it was an incredible moment for me.